Please visit our new showcase section for announcements of new projects and products. 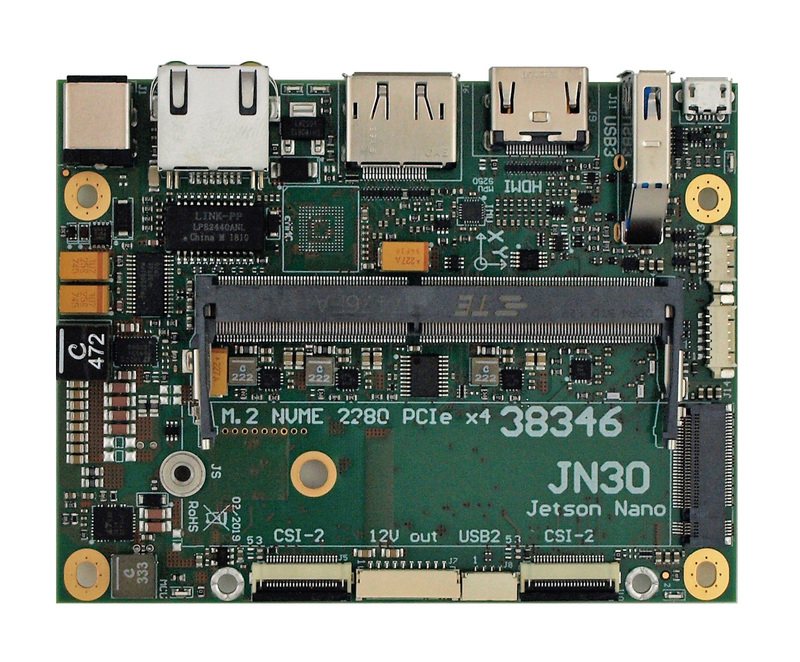 The JN30 is designed for the new entry level compute module in the NVIDIA Jetson family – the Jetson Nano. It supports easy flashing (auto flashing), 2x monitors, 1x USB 3.0, GbE (with PoE), 4x CSI-2, power in 12 to 48V, M.2 NVME SSD (PCIe x4), supercap option for graceful power down. 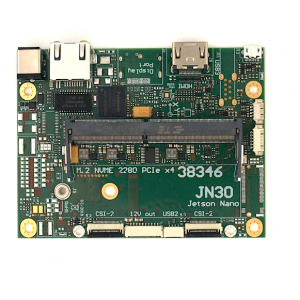 The JN30 will start shipping in April 2019. Beta samples available now. The J220 supports easy flashing (auto flashing). Just plug the USB OTG cable and the Jetson will automatically enter flashing mode. The J220 is firmware compatible to the TX2 dev kit. 2x HDMI (up to 4kp60), 2x USB 2.0, GbE, CAN, 6x CSI-2 (optional), power in 12 to 48V, PCIe optional, supercap option for graceful power down. The J220 is shipping now. 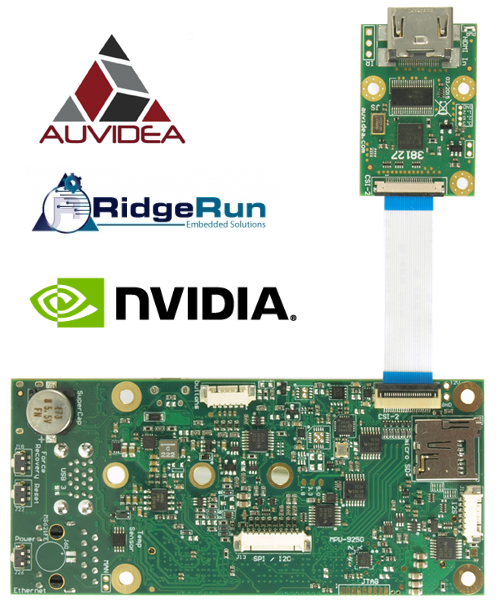 NVIDIA Jetson AGX Xavier with 9 PCIe based GbE (Gigabit Ethernet) ports to connect 9 GigE cameras for multi camera applications. Each GbE port is natively connected and will offer the maximum data rate. 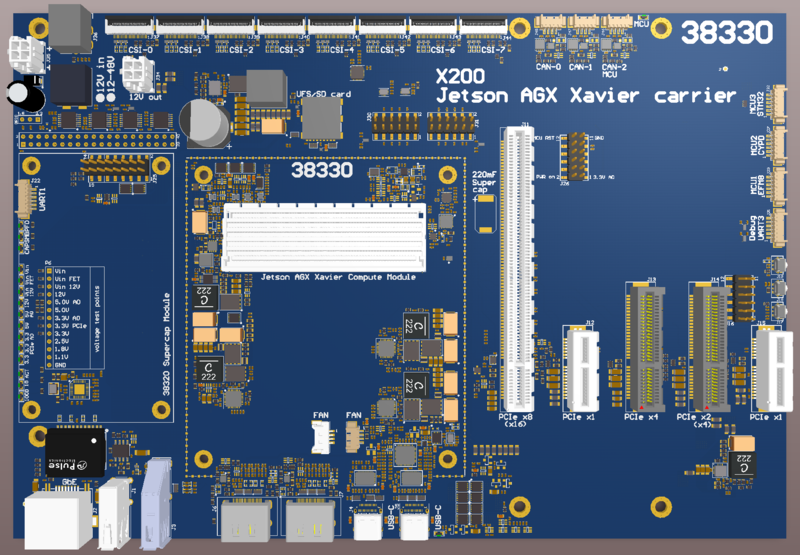 Auvidea’s first carrier board for the new NVIDIA Jetson AGX Xavier. Its focus is to exploit all interfaces of the compute module in a transparent manner. So it exposes all PCIe interface on 5 PCIe slots. 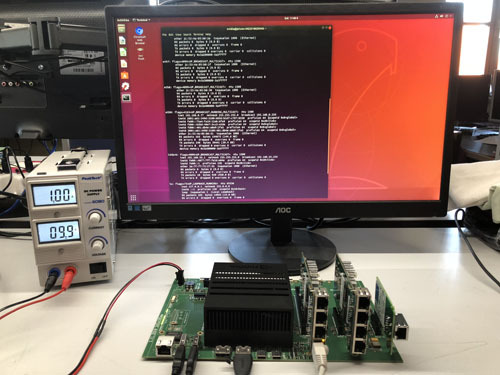 This allows for testing of the full PCIe I/O connectivity. 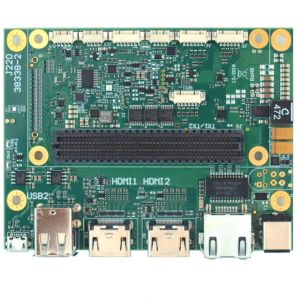 Ports: USB2, USB3, 2x USB-C, 2x HDMI, 2x CAN, 8x CSI-2, GPIO, GbE, UARTs, power input: 12 to 48V. A compact version is in the works. Add-on board for the J94 carrier board for the TX1/TX2 with 2 slots for extension modules (GbE, SATA or USB3). The picture shows a setup with 2 GbE (Intel i210) modules for a total of 3 Gigabit Ethernet ports. Other ports: UART, SATA, USB. 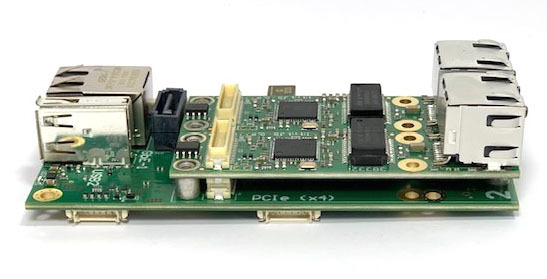 Compact Gigabit Ethernet controller module with Intel i210 controller, magnetics and RJ45 connector (38322). Only 20x70mm. Ideal for connecting multiple GigE cameras to a TX1 or TX2 based system. Optional: PoE to power GigE cameras. 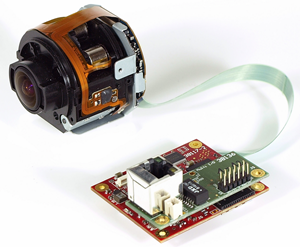 Compact 41.3 megapixel CSI-2 camera module for professional applications. With highest resolution and superior image quality. 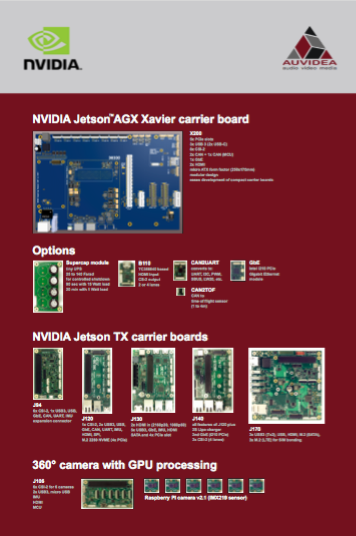 For the Auvidea Jetson TX1 carrier boards. Up to 4kp60 and 8kp15. 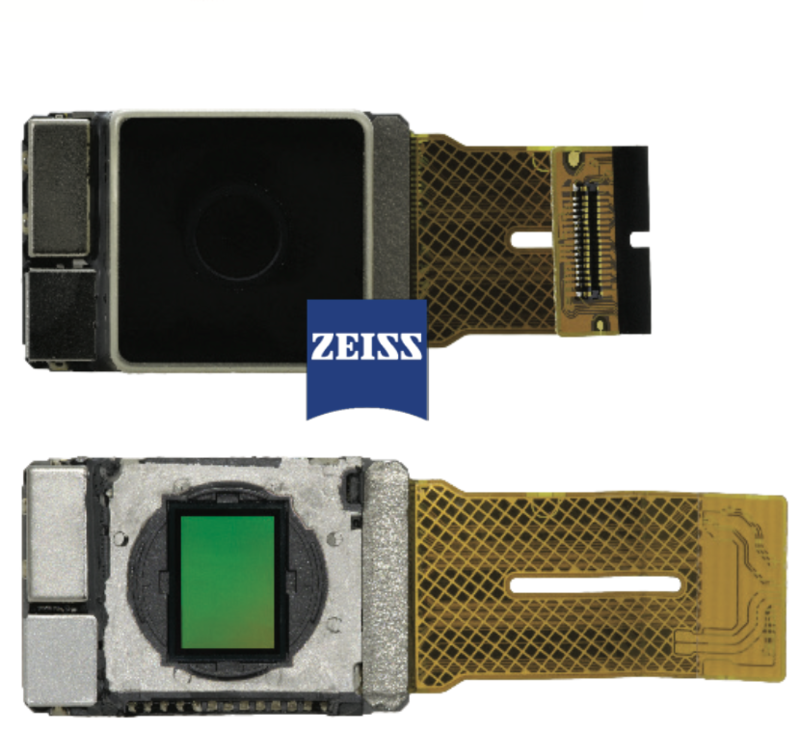 With integrated Zeiss lens. Optional CS mount and camera interface adapter modules. 360° camera systems (with 6 cameras) in development. This unique Lightning to Apple iOS adapter is package in a stylish and sturdy aluminum case. 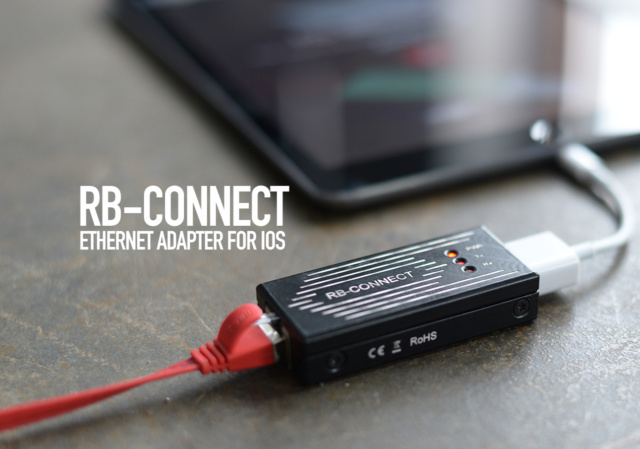 It is powered by the iOS device (iPhone or iPad) and provides a Gigabit Ethernet connection where Wifi is not available or not reliable enough. No software installation required. Just connect to a DHCP server. Preconfigured sets: 3 kits are available in the online shop. 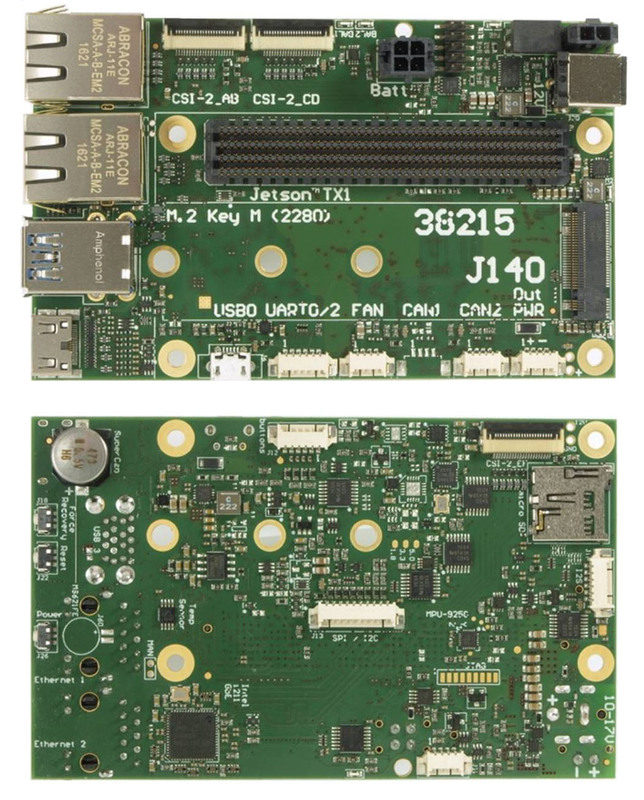 The J140 is based on the popular J120 carrier board for the NVIDIA Jetson TX1 compute module. It has all the features of the J120, but it adds a second GbE controller, 2 more CSI-2 ports with 4 lanes each and a 2S Lipo charger with 2 cell balancer and battery monitor. This facilitates the integration of a battery backup system (UPS). 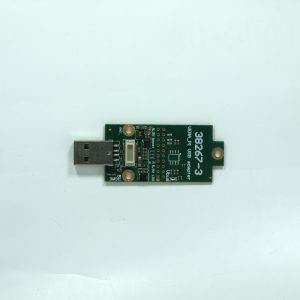 This module features the same high encoding quality as the E1x and E1xx encoder with more flexibility and a very fast boot up time (2 seconds). HDMI input up to 1080p30 (1080p60 optional). H.264 encoder: base, main and high profile. Size: only 22x64mm. Power: 5V (0.5 to 1 watt). 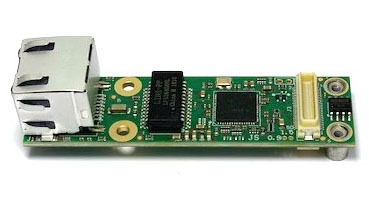 This module features an SDI input and CSI-2 output with 2 lanes, to connect to the CSI-2 camera input and to emulate the Pi camera. No special driver required. General purpose HD video processor for 2 inputs and 1 output: Add-on modules for additional inputs/outputs and audio mixing planned. 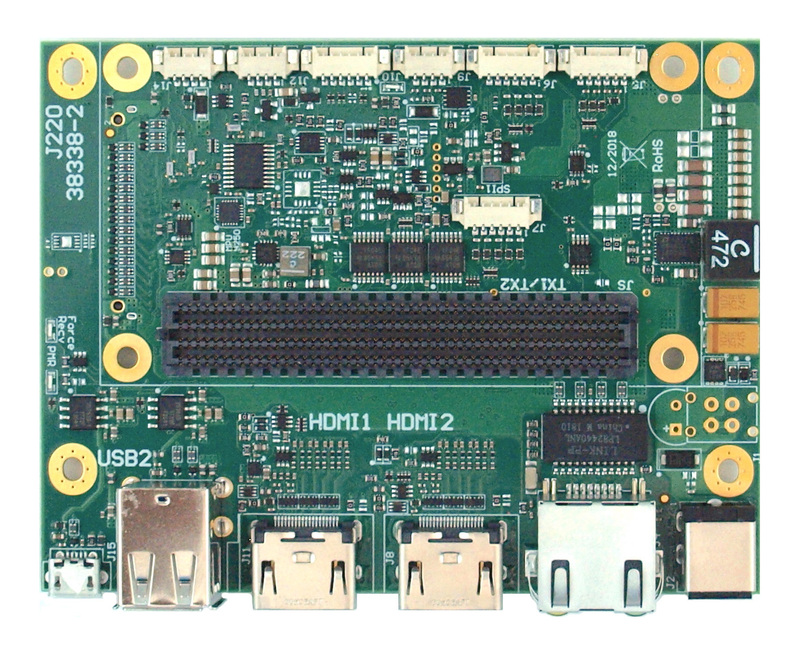 New carrier board for the Jetson TX1/TX2 with 4k video input for high end video processing applications (with TC358840). Other modes may be added in the future. The firmware with compiled kernel and driver may be downloaded from the support page. 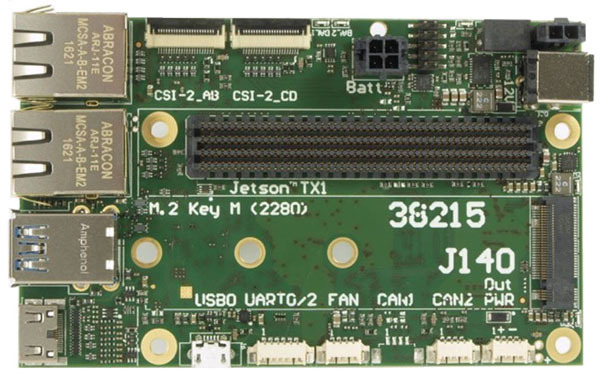 The J120 is a very compact carrier board for the new Jetson TX1 compute module by NVIDIA. 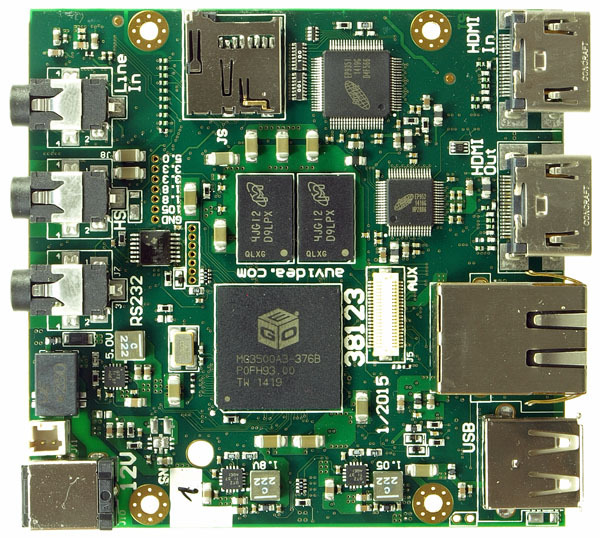 It packs very high CPU and GPU performance into a tiny form factor to create a true super-mini-computer. 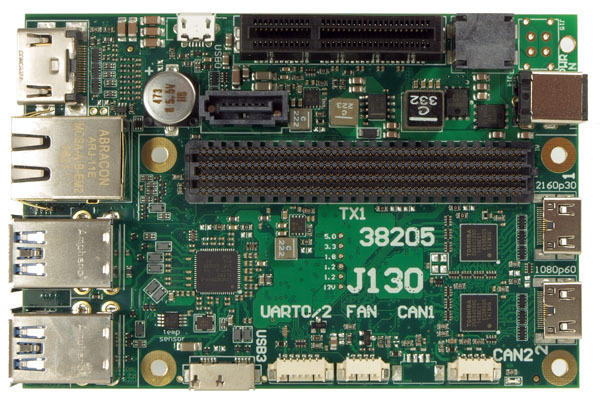 The J120 rev 3 is shipping now. 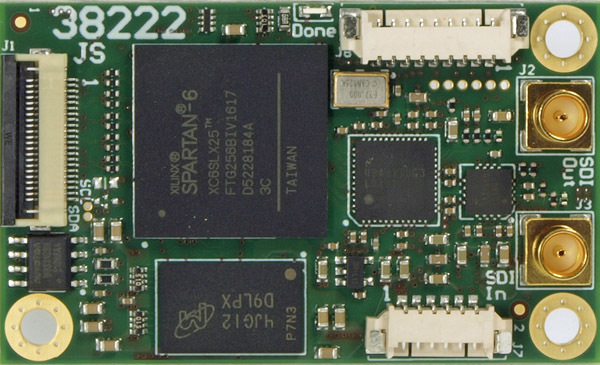 It supports IMU, SPI, 1x CAN and the B102 HDMI input. Please download the firmware from the support page. The wait is over. 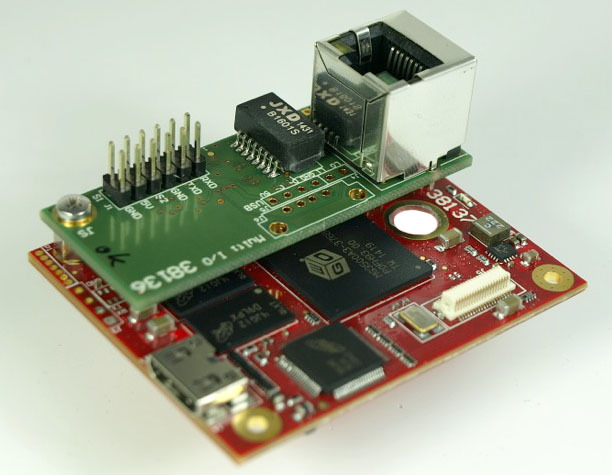 This little video input module for the Raspberry Pi is shipping now. 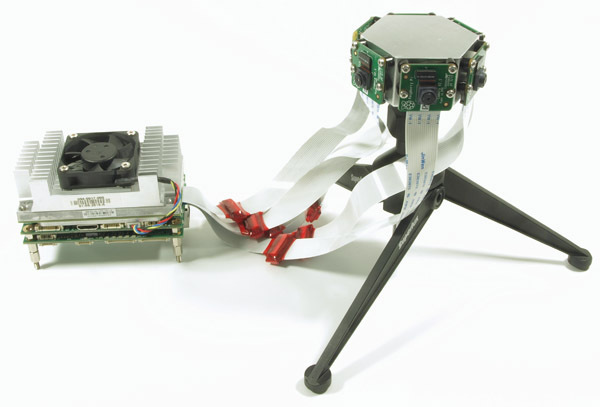 It is supported by raspivid with 1080p25 cameras. Most action cam support this format. Please make sure, that your camera is supported. 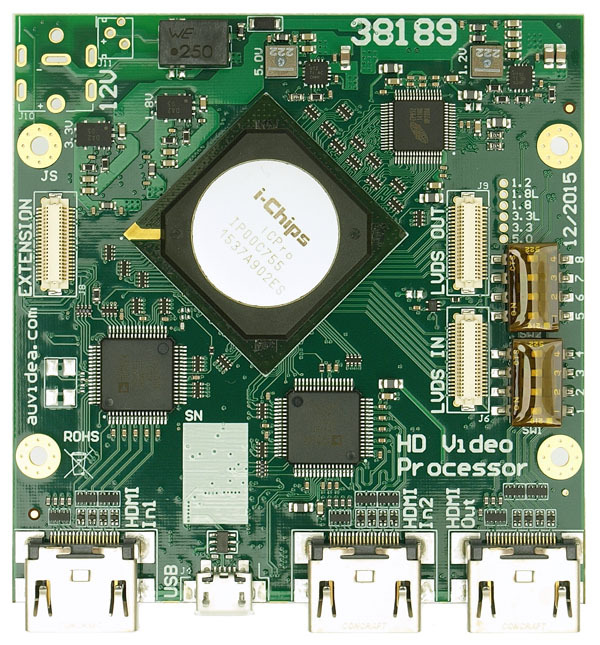 We are developing an HD video processor (38189-3) which convert any resolution and frame rate to 1080p25. Please check the B10x manual for details. The special price is only €69.80 net without shipping. EU customers are subject to 19% VAT (€83.06 incl. 19% German VAT and shipping). The firmware now supports the Sony FCB and the Panasonic block cameras. All camera functions may be remotely controlled via an IP connection (web interface or http request API). Here a setup with a very compact and light weight block camera is shown. For a limited time the complete kit with camera, encoder, cables and power supply is available at a special introductory price. These new compact encoder module feature flexibility, high quality and small size. First samples are available now. The E112 H.264 encoder is a new addition to the E1xx family of encoders. 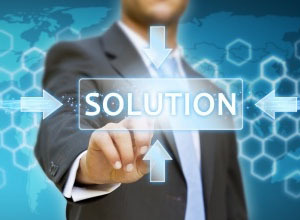 We take your project from concept to a working prototype in just a few days. 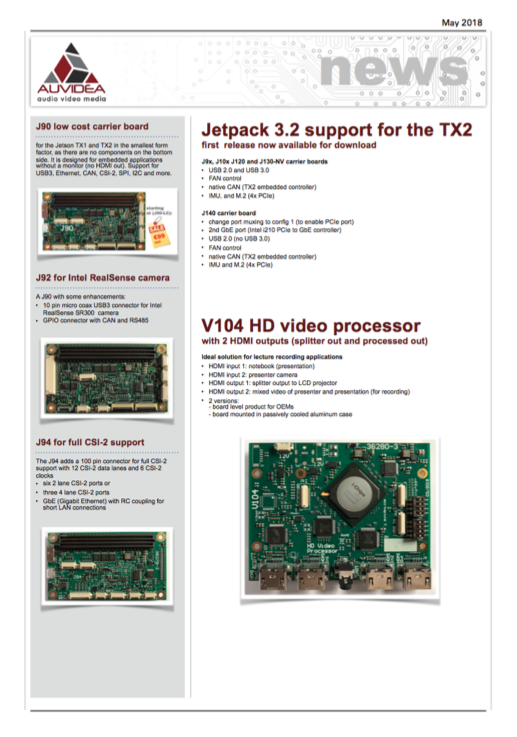 We have design experience with high speed logic such as HD-SDI, HDMI, USB, 100/1000 Ethernet, CSI-2 and more. NVIDIA, the NVIDIA logo, CUDA, Jetson, Maxwell, Tegra and VisionWorks are registered trademarks and/or trademarks of NVIDIA Corporation in the United States and other countries. Other company and product names may be trademarks of the respective companies with which they are associated.